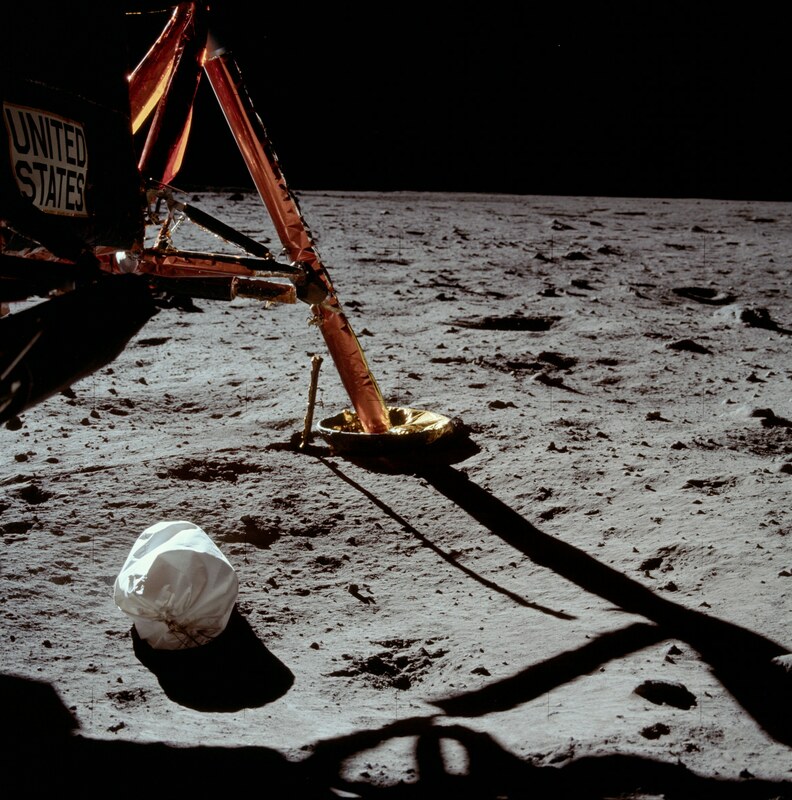 Because the LM cabin was small and weight margins for the return to lunar orbit were tight, jettison bags were used to keep the cabin free of trash, such as food wrappers and urine bags, and of equipment that was no longer needed, such as the hammocks after the last rest period. Generally, one full jettison bag was taken outside at the beginning of each EVA. Once the Commander (CDR) was out on the porch, the Lunar Module Pilot pushed the jett bag into reach with his foot. The CDR then dropped it over the side railing and, later, kicked it under the LM descent stage. On each mission except Apollo 11, an additional jett bag was filled prior to PLSS jettison and went out the hatch with the backpacks. Jett bags were also used in the Command Module. On the J missions (Apollos 15, 16, and 17), the astronauts each stepped into a jett bag at the end of each EVA to encase the suit legs and surpress dust during the rest periods. They also stood on jett bags during suit donning and doffing the keep their feet out of the dust that covered the floor. 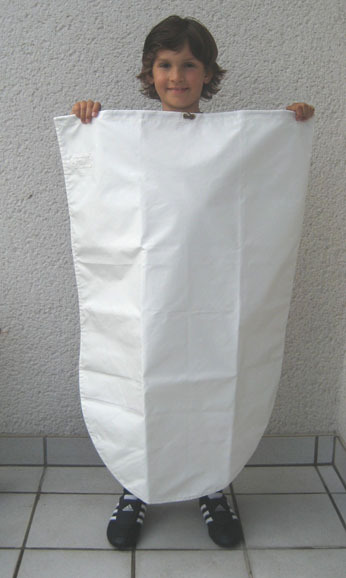 An empty jettison bag, lying flat, is about 101 cm long and 70 cm wide (see below) and weighs 380 grams. In the cramped LM cabin, a full jettison bag had to be carefully placed out of the CDR's way as he got to his knees and then on his hands as he backed out through the hatch. The jettison bags were well suited to the purpose. They were big enough that one per EVA plus one final bag was sufficient for each mission. The bags also made it easy to get all the cabin refuse under the descent stage where it was out of reach of the ascent engine exhaust. The only notable problem was that, when full, they were the size of an eight-year-old boy (see below) and hindered the Commander's movements as he got into position to crawl backward out the hatch. 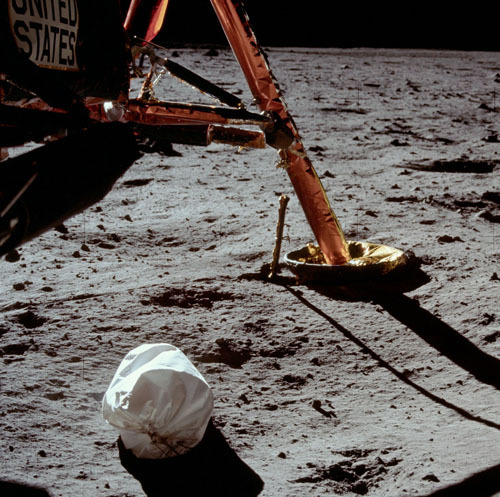 During future lunar operations, jett bags may also be useful in clean up around a spacecraft prior to liftoff and for transport of discarded items to a central location for later recycling and re-use. Although the bags helped the later crews reduce the amount of dust on the cabin floor, this was a stopgap measure. In preparation for future lunar operations, procedures and equipment - such as a dustlock - must be developed to minimize the amount of lunar dust brought into a shirtsleeve environment. shows a jettison bag under Eagle's descent stage. Click on the image for a link to the full image. Christian Lotzmann displays an unflown Apollo jettison bag. In August 2007 when the picture was taken, Chris was 138 cm tall. When lying flat, the empty bag is approximately 101 cm long and 70 cm wide.